This will be one of 2013's most impressive stadiums, though many people don't even know about it yet. More than 8,000 people work day and night to deliver the 60,000-seat stadium this year. Though the project isn't even two years into the construction phase, it already has almost all of the concrete stands structure, while roof and facade cladding are being installed already. This wouldn't be impressive for a minor venue, but not in the case of 60,000 seats and ultramodern facilities, worth over $500 million (some €410 m). 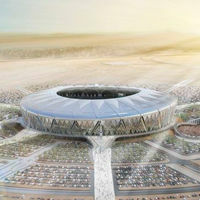 The King Abdullah Sport City Stadium will be completed by the end of this year, said Ahmad Abdul Aziz Al Al-Salem, engineering support supervisor at Saudi Aramco, world's largest oil supplier. The stadium is being erected some 60km from Jeddah and with various adjoining arenas it is to become the metropolis's main sports hub. Smaller sport venues are to be delivered in 2014. What makes this sports city different from similar projects across the Arabian Peninsula is the lack of running track at the main stadium, which will be football-specific. It is also expected to become Saudi Arabia's first ground enabling women to watch games along with men. Normally the law prohibits them from attending same events, but the new stadium is to have special zones behind fake mirrors, where women will be seated out of men's sight. Below are photos of the stadium progress released in June.